This article is about the most formal military uniform. For military uniforms in general, see military uniform. Although full dress uniforms are often brightly coloured and ornamented with gold braids, lanyards, lampasses, etc., most originated as practical uniforms that, with the adoption of even more practical uniforms, were relegated to ceremonial functions. Before World War I, most armies of the world retained uniforms of this type that were usually more colourful and elaborate than the ordinary duty (known as undress), or the active service dress uniform. "Full dress uniform" is often applied in order to distinguish from semi-formal mess dress uniforms, as well as informal service dress uniforms. Yet, full dress uniform is sometimes called dress uniform. Although many services use the term dress generically for uniforms, allowing it to refer to more modern service dress ("combat") uniforms with suitable modifiers (e.g. the British Army's obsolete Battle Dress; and the U.S. Army's obsolete Battle Dress Uniform). Therefore the term dress uniform without prefix typically refers to full dress uniform as described in this article. The British and United States armies were dependent upon voluntary recruiting and found that a smart dress served to attract recruits and improve morale amongst those already serving. The British regimental system fostered numerous distinctions amongst different units. However, this was not limited to volunteer armies, with conscript armies of continental Europe retaining many of the colourful features that had evolved during the nineteenth century, for reasons of national and unit pride. Thus, in 1913 most French soldiers wore red trousers and kepis as part of their full dress, the majority of British foot regiments retained the scarlet tunics for parade and off duty ("walking out"), the German Army was characterised by Prussian blue, the Russian by dark green, and the Austro-Hungary Army by a wide range of differing facing colours dating back to the 18th century. There were usually exceptions to each of these rules, often distinguishing unique units. This included the German cuirassiers, who wore white full dress; British rifle regiments, who wore rifle green; and French mountain troops who wore large berets and light blue trousers. The U.S. Army with its "dress blues" was an exception, with cavalry, artillery and infantry being distinguished only by the different branch colors. After World War I most full dress uniforms disappeared. Many of the regimes that had taken a particular pride in the retention of colorful traditional uniforms had been overthrown and their republican, fascist, or communist successors had little incentive to retain old glories. 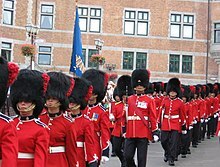 Elsewhere cost and disillusion with the "peacock" aspects of old fashioned soldiering had a similar effect, except for ceremonial guard units and such limited exceptions as officers' evening or off-duty uniforms. Modern armies are characterised by simple and drably coloured dress even for ceremonial occasion, with the exceptions noted above. However a general trend towards replacing conscript armies with long serving professionals has had, as a side effect, a reversion to dress uniforms that combine smartness with some traditional features. Thus the U.S. Army announced in 2006 that uniforms of modern cut but in the traditional dark and light blue colours will become universal issue, replacing the previous grey/green service dress. The French Army has, with the abolition of conscription, reintroduced kepis, fringed epaulettes and sashes in traditional colours to wear with camouflage "trellis" or light beige parade dress. The British Army with its strong regimental traditions has retained a wide range of special features and dress items to distinguish individual units, in spite of recent amalgamations. Although there still exist official patterns for full dress uniforms for each regiment or corps within the British Army, this uniform is seldom issued at public expense, except for units which are often on public duties, such as the Guards Division, Regimental Bands and Corps of Drums, which are bought from the Regiment's allowance. The Regiment of Patricians is one of several units in the Argentine Army whose full dress uniform dates back to the 19th century. In the Armed Forces of the Argentine Republic, the Argentine Federal Police, Argentine National Gendarmrie and Naval Prefecture, dress uniforms are worn during military and civil occasions, especially for the military bands and colour guards. They are a reminder of the military and law enforcement history of Argentina, especially during the early years of nationhood and the wars of independence that the country was a part. The Argentine Army's full dress uniform is green with a visor cap, epaulettes, sword set and scabbard (for officers), long green pants, a black belt, and black shoes or boots. However, several regiments within the Argentine Army are authorized full dress uniforms, which originate from the 19th century, including the Regiment of Patricians, the Regiment of Mounted Grenadiers, and the 1st Artillery Regiment in the Buenos Aires Garrison. The Argentine Navy dress uniform is a navy blue polo shirt with a visor cap for officers and senior ratings and sailor caps for junior ratings, epaulettes and sleeve rank marks (for all offers), a sword set and scabbard for officers, blue long pants (skirts for female personnel), a belt and black leather shoes or boots. Marines wear peaked caps with the dress uniform. Epaulettes are only worn with the dress uniform. For the Argentine Air Force, a similar uniform to one used by the Royal Air Force in the United Kingdom, however the used the color used is much brighter. Regardless of service branch military police personnel wear helmets with their dress uniforms, plus armbands to identify service branch. The Royal 22nd Regiment during the 400th anniversary parade of Quebec City. Most regiments in the Canadian Army utilizes scarlet tunics as a part of their full dress uniform. The Canadian Army's universal full dress uniforms includes a scarlet tunic, midnight blue trousers with a scarlet trouser stripe, and a Wolseley helmet. However, some regiments in the Canadian Army maintain authorized regimental differences from the Army's universal full dress, including several armoured units, Canadian-Scottish regiments, and Voltigeur/rifle regiments. Full dress uniforms for the Royal Canadian Air Force (RCAF) consists of a blue plume, where the headdress allows, an air force light blue tunic, trousers and facings. The RCAF pipe band's full dress uniform is modelled after the uniforms used by Scottish Highland regiments. It includes a feather bonnet; air force blue doublet, facings, and pipings; RCAF tartan kilt; and blue garters. The full dress uniform for the Royal Canadian Navy includes a dark navy blue tunic, trousers, and white facings. However, full dress in the Royal Canadian Navy is no longer issued. Regulations for the wear of uniforms are contained in the Canadian Forces publication Canadian Forces Dress Instructions. Amendments to dress regulations are issued through the office of the Vice Chief of the Defence Staff (VCDS), initially in the form of a CANFORGEN (Canadian Forces General) message, which is placed in the dress manual until an official publication amendment can be promulgated. Dress regulations may also be amplified, interpreted, or amended by the commanders of formations and units (depending on the commander's authority) through the issuing of Standing Orders (SOs), Ship's Standing Orders (SSO), Routine Orders (ROs), and Standard Operating Procedures (SOPs). This may include amplification where the regulations are unclear or are not mandatory; amendments or reversal of some existing regulations for special occasions or events; or the promulgation of regulations regarding the wear of traditional regimental articles (such as kilts). Band members of the Royal Military College of Canada in full dress. The full dress uniform for cadets of the Royal Military College of Canada is similar to the universal full dress uniform of the Canadian Army, with minor variation. Established in 1874, the full dress uniform of an officer cadet has remained essentially the same, although the pillbox hat has replaced the shako. The pith helmet remains in use for ceremonial parade positions only. The youth cadet programs in Canada, the Royal Canadian Army Cadets, Royal Canadian Sea Cadets and the Royal Canadian Air Cadets each maintain their own dress uniforms. Youth-based Canadian cadet organizations are sponsored by the Canadian Armed Forces, with uniforms provided free of charge and funded by the Department of National Defence. Full dress uniforms worn by cadets are modeled after the organization's sponsoring service branch. The modern dress uniform of the Royal Canadian Mounted Police is closely based on the everyday uniforms used by the predecessor North West Mounted Police in the late nineteenth century. It features the Red Serge, a scarlet British-style military pattern tunic, complete with a high-neck collar and dark blue breeches with yellow stripes derived from British and Canadian cavalry uniforms of the same era, and usually a campaign hat (or "stetson") and brown riding boots. The 2001 Chilean Air Force full dress uniform is a medium-blue tunic and pants, worn with a peaked visor cap. A sword belt is worn for parade dress by officers only. Full dress uniform in the Chilean Army is typically coloured feldgrau. The full dress uniforms used by the Chilean Army are based on the German feldgrau-coloured uniforms. However, several units wear uniforms different from the feldgrau uniforms, including cadets of the Army Military School "Bernardo O'Higgins Riquelme," who wear the Prussian blue uniform with a pickelhaube helmet. Some Chilean Army units (Chacabuco and Rancagua regiments for example) wear the Army uniform during the War of the Pacific during parades, with kepis as headdress. The Buin regiment (2nd Army division in the Santiago Metropolitan region) has recently reintroduced the historic Army infantry regimental uniforms of the Chilean War of Independence, having been formed in December 1810 as the 1st Infantry Regiment "Chilean Grenadiers", the Chilean Army's first constituent military unit. The 1st Cavalry Regiment and the 1st Artillery Regiment's Krupp Artillery Battery, both ceremonial units of the ground forces proper, have since 2012 wearing the early 20th century Prussian-style full dress uniforms of the Army's cavalry and artillery branches. The Chilean Navy's officer's dress uniform is dark navy blue with a visor hat, sword strap (for officers, NCOs and cadets during parades and ceremonies only), dark navy blue pants, and black boots. The enlisted uniform (for sailors and petty officers) is a mix of Prussian and British influences having a sailor cap with the dress while the Marine enlisted and NCO uniform is a dark blue polo with pants and a belt plus a peaked cap. The uniforms of the Naval School "Arturo Prat" is also blue with pants, but with a special hat design, similar to those worn by Prat and the crew of the Esmeralda during the Battle of Iquique in 1879. As with many European countries, the French military used in the 19th and early 20th c. many traditional and heavily decorated dress uniforms. Since World War II, they are not in common use and usually restricted to special units in the French Army and National Gendarmerie. Several units, such as the Troupes de Marine, are permitted to wear more decorated variants of their service dress as their full dress uniform. In the Army, only bands and schools have a dress uniform. Units of the Chasseurs Alpins, French Foreign Legion, Troupes de Marine, 1st Spahi Regiment and Tirailleurs are permitted to wear, on special circumstances such as military parades, a more decorated variant of the service or combat uniform, called "Tradition Uniform". The Air Force and the Navy do not issue dress uniforms, but on special ceremonies, such as changes of command, military personnel should add swords or daggers and full medals to their service uniform. Bands of the French Army are permitted to wear special uniform depending on circumstances. On representation duty, they often use a 19th c.-style dress uniform. Military schools of the French Army, including école spéciale militaire de Saint-Cyr, école militaire interarmes and école nationale des sous-officiers d'active, use uniforms dating back to the 19th century. These uniforms are worn by both students and staff. In addition to the military schools, école Polytechnique also maintains 19th century military-styled full dress uniforms. Founded as a military academy, the institution was transformed into a state-sponsored civilian post-secondary school in 1970. However, the institution is still operated by the French Ministry of Defence. French Republican Guard infantry in full dress uniform. The Republican Guard of the National Gendarmerie is the last unit to wear dress uniform as service uniform, as guard of honour detachments are required to wear it while on duty. The cavalry regiment wear a 19th-century dragoon uniform, with metal helmet and white riding trousers, while the infantry regiments use a high-collared traditional gendarmerie uniform. The officer cadets and the staff of école des officiers de la gendarmerie nationale also use uniforms whose styling dates back to the 19th century. Vice Admiral Yedidya Ya'ari of the Israeli Navy, in full summer dress with the rank on the sleeves rather than on the shoulders. In the Israel Defense Forces (IDF), dress uniform is rarely worn inside Israel. When founded in 1948, only khaki combat uniforms were issued to the IDF Ground Arm (Army). In April, 1948, the first military parade was held, in which soldiers wore the Hittlemacher hat, a square cap with a flap at the back to protect the neck from sun exposure. A winter uniform similar to British Army No. 2 Dress was introduced in the 1950s, and uniforms similar to British Army Barrack Dress was often worn for ceremonial parades from the 1950s and 1960s. For female soldiers, these uniforms included skirts, brown dress shoes (known as Golda shoes for Golda Meir) and caps similar to those worn by airline stewardesses known as rooster caps. There are two current uniforms for most enlisted personnel, green or sand coloured Madei Aleph service dress uniforms made from rayon, and green Madei Bet field uniforms made from cotton. Career soldiers are issued a smart uniform including dark trousers and a lighter shirt, worn without a tie, and with a beret or peaked cap. This is also used ceremonially. Until 2016, IDF dress uniform, called Madei Srad in Hebrew, was only worn abroad, either by a military attaché or by senior officers on official state visits. In 2016 Chief of General Staff Gadi Eizenkot announced that all officers ranked Tat Aluf (Brigadier general) as well as certain lower ranked officers would wear the dress uniforms in official ceremonies on Yom HaShoah, Yom Hazikaron and Yom Ha'atzmaut. Because of the small number of uniforms required they are tailor made for the specific officer. Each arm of the IDF (the Ground forces, Navy and Air Force) has its own dress uniform, with separate versions for summer and winter. These are more similar to the civilian business dress suits, or to dress uniforms worn by the British Royal Navy and Royal Air Force, than to either the British Army's No. 1 or No. 2 Dress as a blazer-type jacket is worn, rather than a tunic or a jacket with cargo pockets. A white shirt and a tie is worn with this dress. The ground forces uniform is dark green, with a single-breasted, three-buttoned jacket and tie of the same colour. Headgear worn is the beret. The air force uniform is of the same design, but medium blue. The naval uniform has a darker blue, double-breasted, six-buttoned jacket, with gold-coloured rank insignia on the cuffs. Boots are an essential part of the full dress uniform of the 154th Preobrazhensky Independent Commandant's Regiment (personnel of which are seen here). The uniforms of the Russian Armed Forces were inherited from the Soviet Armed Forces and modified throughout the years. Some features of modern full dress uniform worn by both army and navy personnel date from those of the final Czarist period, prior to 1917. Most notably these include the blue-green shade of the modern army officer's parade and walking out uniform; the dark blue and white dress uniform still worn by sailors; and the ceremonial dress of the Kremlin Guard. Dress uniforms was used by all regiments of the Swedish Armed Forces for ceremonial purposes until the 1960s, when they were discontinued. The Svea Life Guards and the Life Guard Dragoons kept their uniforms for ceremonial use, which are still in use today. The Swedish Air Force have no equivalent to traditional or new full dress uniforms, other than wearing white spats and belts to their No 2 dress, as the rest of the Armed Forces. The Swedish Life Guards cavalry wears royal blue full dress uniforms that date back to 1895. There are three versions of full dress uniforms in use in the Swedish Army as of today, all belonging to the Life Guards. The infantry wears the dark blue uniform of the Svea Life Guards (1st Life Guards) with yellow collar, cuffs and piping which dates back to 1886. The Swedish Army Band wears the uniform of Göta Life Guards (2nd Life Guards), with red collar, cuffs and piping. The headdress of the infantry is mainly the pickelhaube typed helmet in black leather from 1887. On state ceremonies, a white buffalo hair plume is added. Bearskin hats from 1823 are still in use on special occasions. The cavalry, including the Swedish Cavalry Band, wears the royal blue uniform of the Life Guard Dragoons (1st Cavalry) from 1895. Officers have a somewhat lighter colour on their full dress uniform compared to the troopers. The pickelhaube type helmet is made of nickel-plated steel with brass details and dates back to 1879. Changes were made in 1900 which transformed the helmet into a cuirassier typed helmet, and also in 1928 with the amalgamation of the 1st and 2nd Cavalry Regiments, adding a halm wreath, a golden laurel and officers chin straps with lion mascarons from the Life Regiment Dragoons (2nd Cavalry). On state ceremonies, officers wear a white buffalo hair plume, whereas troopers wear a horse hair ditto. Two officers in full dress on the royal barge Vasaorden. In the Swedish Navy, full dress is restricted to naval officers serving on the Vasaorden. In the Swedish Navy, there is one uniform that is in use. To wear it one has to be a naval officer and have been serving on the royal barge "Vasaorden" (Order of Vasa), a ship used very rarely on ceremonial occasions. The uniform dates back to 1878. Most of the various uniforms worn by the British Army today originate in former combat uniforms. At the start of the 19th century, British Army Regiments of Foot, trained to fight in the manner dictated by a weapon (the musket) which demanded close proximity to the target, were not concerned with camouflage, and wore red coats (scarlet for officers and sergeants). Rifle regiments, fighting as skirmishers, and equipped with rifles, were more concerned with concealment however, and wore dark green uniforms. Light Infantry regiments were also trained as skirmishers but wore red uniforms with green shakos. Whereas the infantry generally wore polished brass buttons and white carrying equipment, the Rifles wore black. Infantry uniforms of the British Army, from 1750–1835. Full dress uniforms in the British Army originate from former combat uniforms. Heavy dragoons and Royal Engineers wore red (or later scarlet) coats. Most of the remainder of the British Army, however, including the Royal Regiment of Artillery, hussars, all but one lancer regiment, and various support elements wore dark blue uniforms. These varied greatly in detail according to the arm of service or in many cases the individual regiment. Reserve units were for the most part distinguished by having silver (rather than gold-coloured) lace, buttons and accoutrements in full dress. From the Crimean War on, a narrow red stripe (piping) down the outside of each trouser leg was common to all red coated infantry units. Cavalry however wore stripes of regimental colour (white, yellow, blue/grey etc.) on their riding breeches. Scottish Highland regiments did not wear trousers, favouring the kilt, and Scottish Lowland regiments adopted tartan trews. All Scottish regiments wore doublets of distinctive cut instead of the tunics of English, Irish and Welsh units. Full dress headwear varied (both from regiment to regiment, and over time as influenced by military fashion): bearskins were worn by the Foot Guards, the 2nd Dragoons (Royal Scots Greys) and (in a different form) by Fusiliers. Plumed helmets were worn by the Dragoons (except 2nd), Dragoon Guards and the Household Cavalry. Hussars wore their distinctive busby, which also came to be adopted by the Royal Artillery, the Royal Engineers and certain other Corps; it was also worn in a different form by Rifle regiments. The Lancers had their chapka. Infantry of the line often wore shakos (later supplanted by the 'home service helmet'), as did others; though Scots and Irish regiments tended to have their own distinctive full-dress headwear. General officers and staff officers usually wore plumed cocked hats in full dress, as did regimental staff officers and those of some support services. In hotter climates, for all of the above, a white pith helmet was often substituted. The rise of rifles and smokeless powder led to the adoption of khaki uniforms in the field, with blue, scarlet, and rifle green tunics relegated to ceremonial/parade use. Beginning with the Second Anglo-Afghan War of 1878, the British Army began adopting light khaki uniforms for Tropical service that was first introduced in 1848 with the Corps of Guides in India. This innovation arose from experience fighting irregular forces in India, for example on the Indian North-West Frontier and during the Indian Mutiny, and in Africa during the Anglo-Zulu War, as well as the invention of smokeless gunpowder and the increasing effectiveness and usage of rifles. In 1902 a darker shade of Service Dress (SD) was adopted for field and ordinary use in Britain itself. The scarlet, blue and rifle green uniforms were retained for wear as full dress on parade and "walking-out dress" when off duty and out of barracks. As worn between 1902 and 1914 by all non-commissioned ranks, walking-out dress was essentially the same as review order, except that a peaked cap or glengarry was worn instead of the full dress headdress and overalls (strapped trousers) were substituted for cavalry breeches. When khaki web carrying equipment was introduced, the earlier, white or black leather carrying equipment was reduced to just the belt (and sometimes a bayonet frog), for wear with the dress uniform. As with the earlier uniforms, the officers' uniforms differed in quality and detail from those worn by the Other Ranks. Officers purchased their own dress uniforms from regimentally approved Savile Row tailors while other ranks were issued all orders of dress from government stocks. A massed group of British Foot Guards in full dress uniform. Blue and scarlet-coloured full dress uniforms were restored to the Foot Guards and the Household Cavalry in 1919. With the outbreak of World War I in August 1914 all full dress and other coloured uniforms ceased to be worn by the British Army. After 1919 they were restored to the Household Cavalry and Foot Guard for ceremonial purposes but not to the bulk of the army. Officers were authorised to wear full dress for certain special occasions such as Court levees (formal presentations to the Monarch) and it was customary to wear these uniforms at social functions such as weddings. By 1928 bands were wearing full dress on occasions where they were not parading with the remainder of the regiment (who had only khaki service dress). The pre-1914 dress uniforms were still held in store and occasionally reappeared for historic displays. However, there was no serious attempt to make them general issue again, primarily for reasons of expense. When (khaki) Battle Dress (BD) uniforms, which had a short blouse instead of a tunic, were adopted immediately before the Second World War, the older khaki Service Dress became a smart uniform for wear on the streets, and on moderately formal occasions. After World War II the coloured, full dress uniforms were again reintroduced for ceremonial occasions by the Brigade of Guards and to a limited extent by regimental bands. Officers (and later senior non-commissioned officers) resumed wearing mess uniforms in traditional colours from about 1956 on. These are still worn, although regimental amalgamations have led to numerous changes from the pre-war models. The BD uniform was eventually replaced in 1961 by green, cotton combat uniforms. After World War II the design of the Other Ranks' BD blouses had been modified for wearing collared shirts with ties (like the officers' pattern), and was used for a time, around the barracks, but eventually disposed of completely. The band for the Royal Regiment of Scotland in full dress. Scottish regiments retain a number of historical elements in their uniform, including their kilts and doublets. With limited exceptions, the unique regimental full dress uniforms finally disappeared after 1939; today they are only generally worn, on ceremonial occasions, by the Bands and Corps of Drums, by certain representatives on parade (e.g. some regimental Pioneers, or those forming a guard of honour) and by the regiments of the Household Division. In most regiments they were replaced by a generic dark blue uniform known as No 1 Dress. This dated back to plain "patrol" uniforms worn by officers before 1914 as an informal "undress" uniform. An early version had been worn by some units in the 1937 coronation of King George VI and Queen Elizabeth but had not been made general issue at the time. In the form adopted after World War II, most regiments were distinguished only by coloured piping on the shoulder straps, coloured hat bands, buttons and badges. However Scottish regiments retained their kilts or trews as well as the distinctive doublets (in "piper green" or dark blue) of the former scarlet uniform. Rifles had all dark green uniforms and cavalry retained a number of special features such as the crimson trousers of the 11th Hussars or the quartered caps of lancer regiments. A white, lightweight tunic (No 3 Dress) was also authorised for use in the tropics, or during the summer months in warmer temperate climates (such as Bermuda). The blue "home service" helmets were not worn as part of the No 1 dress uniform, except by members of some bands or corps of drums which retained their old full dress uniforms, at regimental expense. English Rifle regiments were amalgamated into the Royal Green Jackets, which continued to wear a dark green dress uniform, and black buttons and belts. Recent changes have brought the Royal Green Jackets and The Light Infantry together into a single regiment The Rifles, which continues to wear dark green. The Waterloo Band of The Rifles in full dress. The Rifles continue to use rifle green in their full dress uniform. Berets were introduced initially into the Royal Tank Corps in the First World War and their use became more widespread in the British Army during and after the Second World War to replace side caps for wear with combat uniforms when protective headgear was not being worn. Originally, khaki was the standard colour for all units, but specialist units adopted coloured berets to distinguish themselves. For example, airborne forces adopted a maroon or red beret. This has since been adopted by many other parachute units around the world. The Commandos adopted a green beret. The Special Air Service (SAS) initially adopted a white beret quickly changing this to a beige or sand coloured one. From 1944 they wore the Maroon airborne forces beret but the beige beret was re-adopted following the re-formation of the Regular SAS in Malaya. Khaki was replaced as a generic colour for berets after the war by dark blue, and this is the colour worn by those units not authorised to use a distinctively coloured beret. Berets fall mostly outside the scope of this article as a peaked cap, with a coloured hat band, is intended to be worn with the No 1 Dress uniform, berets are the most common form of headdress seen with other orders of dress and are worn in No1 and 2 dress by some Regiments and Corps. A khaki, peaked cap may also be worn by officers in some units with the No 2 khaki service dress. The blue or green No 1 Dress was never universally adopted after its initial introduction in 1947. The reason was mainly one of economy, although it was sometimes criticised as being too similar to police and other civilian uniforms - lacking the immediately recognisable military status of both scarlet and khaki. Khaki No 2 dress being the most usual order of dress for parades and formal occasions. Officer cadets at the Royal Military Academy Sandhurst in full dress. As noted above, the practice of issuing other ranks in line regiments with full sets of both service dress and dress uniforms effectively ended in 1914 and was never completely returned to. Today, with the exceptions noted above, full dress or No 1 Dress uniforms are only held in limited quantities as common stock, and issued only to detachments on occasional special ceremonial occasions. Practices do however vary between units and historic items of uniform are more likely to appear where tradition is particularly strong. As an example, the Royal Military Academy Sandhurst wore scarlet and blue "review order" uniforms until World War I, substituted khaki service dress for parade from 1919 to 1939 and now holds dark blue No 1 dress uniforms for the use of its cadets. The Royal Military Police retain the latter order of dress for general issue. Air Vice-Marshal Philip Game in full dress, c. 1930. At the time, the Royal Air Force's full dress included headgear designed to resemble flying helments from World War I. Historically, the Royal Air Force regulations permitted the wearing of a full dress uniform in both home and warm-weather variants. Although the home wear version of full dress is no longer worn (except in a modified form by RAF bandsmen ), the tropical full ceremonial dress continues to be authorised. The temperate full dress uniform was introduced in April 1920. It consisted of a single-breasted jacket in blue-grey with a stand-up collar. Rank was indicated in gold braid on the lower sleeve and white gloves were worn. As with the British Army after 1914, full dress was not general issue during the inter-War period, but was authorized for wear by specific categories such as bandsmen and commissioned officers. The latter generally wore full dress only for infrequent occasions such as attendance at court levees and social functions such as weddings. Military attaches and royal aides de camp were amongst the few serving officers who might have regular occasions to wear full dress. Initially the full dress uniform was worn with the service dress cap. However, in 1921 a new form of head-dress was introduced. It was designed to resemble the original flying helmet and it consisted of a leather skull cap trimmed with black rabbit fur. The helmet also featured an ostrich feather plume which was connected at an RAF badge. This helmet was never popular and junior officers were eventually permitted to wear the service dress hat on full dress occasions. Group Captain HRH the Duke of York (later King George VI) wore RAF full dress at his wedding to Lady Elizabeth Bowes-Lyon in 1923. The Duke wore or carried the full dress headgear rather than the service dress cap. Vice Admiral Philip Watson in ceremonial day dress. Introduced in 1960, ceremonial day dress is a variant of the Royal Navy's full dress uniform that was taken out of service in 1956. Since the mid-eighteenth century, when naval uniforms were introduced, Flag Officers had different full-dress and undress versions, the latter being worn from day to day, the former only for formal occasions. By the late nineteenth century, an officer's full dress uniform consisted of a navy double-breasted tailcoat with white facings edged in gold (on the collar and cuff-slashes), gold lace (indicating rank) on the cuffs, epaulettes, sword and sword-belt, worn with gold-laced trousers and a cocked hat. This order of uniform lasted through the first half of the twentieth century, and was worn by Prince Philip at the Coronation of Elizabeth II. In 1956, however, it was abolished, leaving No. 1 uniform as the most formal order of dress. Subsequently, in 1960, full dress uniform was reintroduced in the form of Ceremonial Day Dress. Worn only by limited categories of senior officers this is very similar to the old full dress, but without fringed epaulettes and slashes, and worn with a peaked cap. The Army Air Forces became the US Air Force in 1947. The First US Air Force Dress Uniforms were known as "Uxbridge Blue" and were developed and manufactured at the former Bachman Uxbridge Worsted Company in Uxbridge, Massachusetts. The United States Air Force Auxiliary (Civil Air Patrol), is authorized by Congress to wear the United States Air Force uniform since it was recognized as a department of it in 1942. The United States Army's dark blue dress uniform has been in use since 1938. The United States Army has one blue uniform which has served as the service dress uniform for officers and warrant officers since 1937. It was also authorized for wear by enlisted men and women at their own expense when off duty. It was decided in 2006 that all U.S. Army personnel were to transition to the blue uniform. New blue Army Service Uniforms were issued to initial entry training soldiers beginning in the 4th-quarter of fiscal year 2010. This replaces the "Army Greens" as a service dress, which are scheduled to be phased out of use in the 4th-quarter of Fiscal Year 2015. Dark blue was the traditional color of most Continental/U.S. Army uniforms from 1774 until 1902. Even after the introduction of khaki for field wear in that year dark blue tunics and light blue trousers continued in use for full dress and off duty wear until 1917. The Army blue uniform comprises a dark-blue coat, light-blue or dark-blue (general officers) trousers, a white turndown-collar shirt, black four-in-hand or double windsor necktie, a black beret, and often a ceremonial belt. When worn with a black bow tie, the Army blue uniform constitutes a formal uniform and corresponds to a civilian tuxedo. When worn with a black four-in-hand or double windsor necktie, the Army blue uniform is an informal uniform. Personnel assigned to select Army bands, as well as the 3rd Infantry Regiment's Commander-in-Chief's Guard, are authorized one of several different styles of alternate dress uniforms for public duties. Cadets at the United States Military Academy wear a grey swallow-tailed blouse with white trousers and black shako for parades and drills. Finally, some National Guard units have unique, regimental uniforms that are used for ceremonies. The Marine Corps has a dress blue uniform, in addition to their green service uniform which is part of a long line of historical Marine Corps uniforms dating back to the American Revolution. The most formal of a Marine's uniforms outside of the elaborate evening dress uniforms of officers and senior enlisted, it is often referred to as "Dress Blues", due to its color (as distinguished from the green and khaki service uniforms), and can be worn in many forms. It is the only uniform of the United States military to use all of the colors of the nation's flag and incorporates button designs which are the oldest military insignia still in use in the United States Armed Forces to this day. Enlisted marines dressed in Blue Dress Uniforms. From left to right: "B", "B", "A", "D", and "C". Dress Blue "A" has a long sleeve choker-collar midnight blue outer blouse, white barracks cover, with all medals and service ribbons. Enlisted coats have a red trim and more buttons down the middle of the coat than officers. Dress Blue "B" is the same as "A", but service ribbons and marksmanship badges are worn instead of medals. Dress Blue "A" (with medals worn) is strictly reserved for official ceremonies, while Dress Blue "B" may be worn on leave or liberty. Dress Blue "C" is the dress blue uniform worn with the long sleeve khaki shirt (without coat). Service ribbons and badges may be worn. All the blue uniforms have the same trousers, cover, and black shoes, with the exception of general officers who wear dark blue trousers in the same color as the coat. Officers, Staff Noncommissioned Officers, and Noncommissioned Officers wear blood stripes on their trousers. Blood stripes are 1.25" in width for NCOs and SNCOs, 1.5" for officers, and 2" for general officers. A sword may be worn when the individual is in command of troops in formation—the Mameluke sword for officers, the NCO sword for NCOs and SNCOs. When wearing the sword and Dress Blue coat, officers wear the Sam Browne belt. For enlisted, the sword is worn with a white waistbelt and brass buckle when wearing the Dress Blue coat. The Marine Corps is the only branch of the United States military which regularly allows NCOs to carry a sword. For enlisted Marines, they earn the right to carry the NCO sword and wear the scarlet blood stripe on their blue trousers when they achieve the rank of Corporal. Dress uniform for the Marine Corps Mounted Color Guard consists of a blue dress coat, white breeches, and polished knee-high boots. Members of the United States Marine Corps Band, and the United States Marine Drum and Bugle Corps are authorized different dress uniforms, known as Red-Dress (a scarlet blouse with a blue trim). 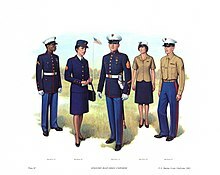 Before 1998, certain ceremonial Marine units, such as the Silent Drill Platoon, wore a blue/white dress uniform in which white trousers were substituted for blue while performing ceremonial functions. The blue/white version is now an authorized summer uniform for officers, SNCOs, and on certain functions, NCOs. The Marine Corps Mounted Color Guard currently wears the blue dress coat with white riding breeches and polished black knee-high riding boots although in the past they have worn blue riding breeches with the red blood stripe. Another uniform, the obsolete Dress White uniform, was a white version of the standard dress coat and trousers, was authorized only for officers, and resembled the Navy's Officer/CPO dress whites. No blood stripes were authorized, and white shoes were worn. This uniform was superseded by the Blue/White Dress uniform in 2000. The Dress White uniform consists of a stand-collar white tunic, white trousers, and white dress shoes. Rank for officers is displayed on shoulder marks for males and on the sleeve cuffs for females, while CPO rank insignia is worn on the collar for both sexes. Service dress white includes service ribbons , whereas full dress white includes service ribbons and medals. This uniform is informally called "Chokers", due to the stand-collar. An officer of the United States Navy in Dress Blue uniform. The Dress Blue uniform consists of black shoes, navy blue (black in appearance) coat and trousers, a white shirt and either a Windsor or formal bowtie. As with the white uniforms, only service ribbons are worn with Service Dress Blue, while service ribbons and medals are worn with Full Dress Blue. Depending on the occasion, officers may also wear swords with either Full Dress White or Blue. Both the white and blue uniforms are worn with the distinctive peaked cap with white cover. Naval enlisted personnel ranked Petty Officer First Class, E-6, and below also have seasonal uniforms. The dress white and blue uniforms are both of the traditional "sailor suit" or crackerjack type for men, and women wear the same as summertime dress white uniform. It consists of a pullover shirt, called a jumper, with a V-neck going to a square collar flap, a black neckerchief, and bell-bottomed trousers. The white uniform is worn with a white belt and silver buckle, and the sleeves come down to the middle of the hand. The blue uniform features the thirteen button trousers, and has three rows of white piping on the collar and cuffs. Women wear a uniform similar to female officers and Chiefs, but with silver buttons, and a cover device with a spread eagle and "USN". Before 1972, U.S. Coast Guard personnel generally wore the same uniforms as the U.S. Navy but with distinctive Coast Guard insignia, primarily distinctive cap devices for officers and chief petty officers, incorporation of the Coast Guard shield in lieu of line or staff corps insignia for officers, and differentiated uniform buttons on dress uniforms. Members of the United States Coast Guard in Dress Blue Uniform. In 1972, the current Coast Guard Service Dress Blue uniform was introduced for wear by both officers and enlisted personnel; the transition was completed during 1974. Relatively similar in appearance to the old-style U.S. Air Force uniforms, the uniform consists of a blue four-pocket single breasted jacket and trousers in a slightly darker shade. Unlike the U.S. Navy, officers and CPO's do not wear khaki; all personnel wear the same color uniform. USCG officers (and 1/c cadets preparing for graduation from the U.S. Coast Guard Academy) are issued Dress Whites for change of command and other formal ceremonies. The Dress White uniform is slightly different for the men's and women's versions - men wear a high stand-collared white tunic, white trousers, and white shoes, while women wear a uniform similar to the Service Dress Blue uniform but with a white coat and skirt or trousers. Both genders wear shoulder boards rather than sleeve stripes, as well as medals (for Full Dress White) or ribbons (for Service Dress White), combination cover, and sword (for Full Dress White). The uniform is nearly identical to the Navy's Full Dress Whites, but the buttons and combination cover device are Coast Guard specific. Within the National Bolivarian Armed Forces of Venezuela dress uniforms are commonplace within its services. The Presidential Honor Guard Brigade wears dress uniforms similar to those used by the Hussar troop raised by Simon Bolivar in 1816. It is of a red tunic with gold buttons and black pants, belt and a black (formerly brown) busby hat, plus epaulettes worn by officers. The Caracas Battalion of the Ministry of Defense wears a light blue uniform with white buttons, black pants, a belt, boots or black shoes and the red beret while the Daniel O'Leary Battalion of the Army Headquarters wears an identical uniform but with the dark blue beret. Wikimedia Commons has media related to Full dress uniforms. ^ Carman, W.Y. A Dictionary of Military Uniforms. p. 61. ISBN 0-684-15130-8. ^ Jouineau, Andre. French Army in 1914. pp. 7–59. ISBN 978-2-35250-104-6. ^ Harrington, Peter. British Army Uniforms in Color. pp. 10–146. ISBN 0-7643-1302-9. ^ Becker, Carl. The Kaiser's Army in Color. pp. 11–14. ISBN 0-7643-1173-5. ^ Kennedy, Robert W. Uniforms of Imperial & Soviet Russia. pp. 8–27. ISBN 0-7643-1320-7. ^ Mollo, John. Military Fashion. p. 231. ISBN 0-214-65349-8. ^ British Army Dress Committee (August 2005). Joint Service Publication 336: The Defence Supply Chain Manual. Vol. 12, Part 3, Pamphlet 12, Sect. 1 (3rd ed.). p. Para. 117, 119. ^ a b c "Full dress and undress uniforms". Dress Instruction. Government of Canada. 12 September 2018. Retrieved 10 January 2019. ^ a b "6-1". Canadian Armed Forces Dress Instruction (PDF). Canadian Armed Forces. 1 June 2001. p. 211. Retrieved 11 June 2018. ^ (in French) INSTRUCTION N° 10300/DEF/EMAT/LOG/ASH - DEF/DCCAT/LOG/REG relative aux tenues et uniformes des militaires des armes et services de l’armée de terre. ^ "Senior IDF officers to wear dress uniforms during ceremonies". Arutz Sheva. 5 May 2016. Retrieved 15 May 2016. ^ Sanders, Denise. "The magic of the 125th Tournament of Roses Parade". Baltimore Sun. Retrieved 2 January 2014. ^ U.S. Bureau of Land Management. "Wild Horse & Burro Program and the United States Marine Corps Color Guard". U.S. DEPARTMENT OF THE INTERIORBUREAU OF LAND MANAGEMENT. Retrieved 2 January 2014.